Section 5.0 Introduction to Power Amplifiers. Understand the Operation of Power Amplifiers. Section 5.1 Power Transistors & Heat Sinks. • Power De-rating & High Power Operation. • Thermal Resistance of Heat Sinks. Section 5.2 Class A Power Amplifiers. •The limitations due to the efficiency of class A power amplifiers. •Transformer coupled Class A power output stages. Section 5.3 Class B Amplifiers. • Advantages & disadvantages of class B. Section 5.4 Push-pull Driver Stages. • Transistor phase splitter stages. • Emitter coupled phase splitter. Section 5.5 Class AB Amplifiers. • Temperature & DC stabilisation. • Mid-point & crossover adjustment. Section 5.6 Amplifier Classes C to H.
• Class D Power Amplifier operation. • Class E & F Power Amplifiers. • Class G & H Power Amplifiers. • Test your knowledge and understanding of Power Amplifiers. Amplifier circuits form the basis of most electronic systems, many of which need to produce high power to drive some output device. 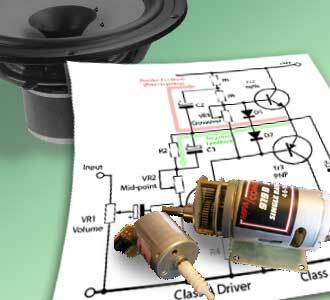 Audio amplifier output power may be anything from less than 1 Watt to several hundred Watts. Radio frequency amplifiers used in transmitters can be required to produce thousands of kilowatts of output power, and DC amplifiers used in electronic control systems may also need high power outputs to drive motors or actuators of many different types. This module describes some commonly encountered classes of power output circuits and techniques used to improve performance. The voltage amplifiers described in Amplifiers Module 1, Module 2, Module 3, & Module 4 can increase the amplitude of a signal many times but may not, on their own, be able to drive an output device such as a loudspeaker or motor. For example a voltage amplifier may have a gain of 100 and be able to amplify a 150mV signal to an amplitude of 15V and it is quite possible that the amplifier can feed that 15V signal into a load of say 10KΩ, but if the load is changed to a value of 10Ω, the voltage amplifier would not be able to provide the extra current needed to maintain an output voltage of 15V across 10Ω. Likewise, a current amplifier may have a gain of 100 and be able to amplify a 10µA signal to 1mA at a very low output voltage, but be unable to supply a 1mA signal at say 10V. In either case the voltage or current amplifier does not have sufficient POWER (volts V x current I). Voltage and current amplifiers can make use of small transistors and do not draw large amounts of power from the power supply in order to amplify signals by often, very large amounts. However the small transistors they use have very tiny junction areas and so cannot handle the power needed to drive some output devices without overheating.